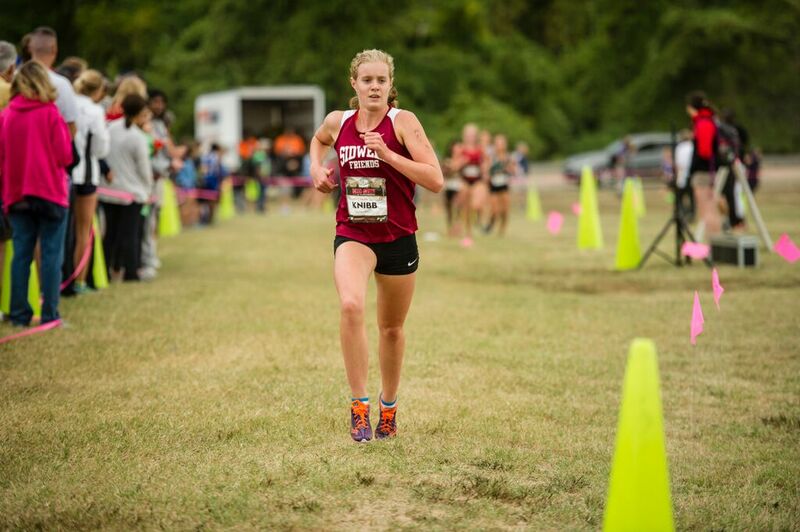 Forty-one schools and more than 3,000 high school cross country runners flocked to Kenilworth Park in Northeast D.C. Saturday for the second DCXC Invitational. The invitational was for the most part a D.C., Maryland, Virginia showdown, but the meet also featured appearances from Thousand Islands Secondary School, from Ontario, Canada, and Trinity High School, from Louisville, Kent. The format was like last year. 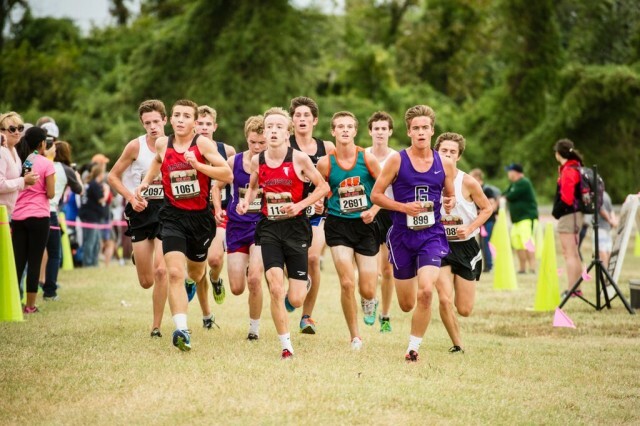 The varsity races were split among classes and each race scored just three runners per team. A new college race allowed American, George Washington, Howard and Catholic universities to race in the district. 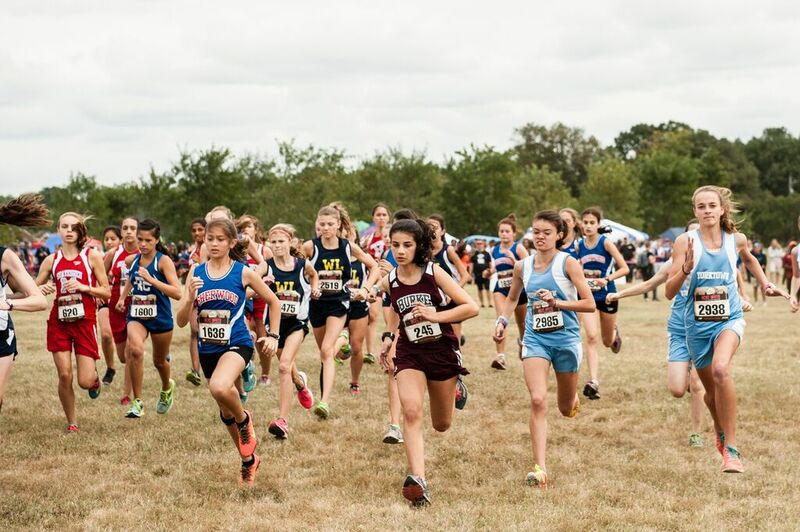 [button-red url=”http://dcxc15.s3-website-us-east-1.amazonaws.com/#/” target=”_self” position=”left”] Results [/button-red]The results compiled for all races led to James Madison winning the girls’ overall team title and Trinity – 18-time Kentucky state champions – winning the boys’ races. James Madison, which also won the aggregate overall title, was followed by Walt Whitman, Walter Johnson, W.T. Woodson and Yorktown. Trinity was followed by Wootton, Gonzaga, Thomas Jefferson, and James Madison. Trinity did more than up the level of competition. The all-boys Catholic school added Irishness plus some great soundbites. Walking through the DCXC Invitational felt like walking through a festival. The fields were covered with tents; inside the track DJ Thunderbunny took requests. Parents, fans, and teammates massed in several places to provide support: the one-mile mark, the portion looping behind the starting line, and particularly the final stretch on the track. The course itself was flat, run on an open, windswept field marked with pink flags and ribbons and neon cones. The feared rain never came and the temperature was decidedly cool (last year temps hovered above 90 degrees). Wind, however, was the day’s big factor. Had the freshman girls turned around just before the gun fired, after one false start, a little past 3 p.m., they might have seen one team’s tent go temporarily airborne. One athlete in the freshmen girls race who was not fazed by the headwinds at all was Tuscarora’s Ava Hassebrock, who won the race in 19:58. “When you are running, the wind is really nice because it cools you off,” she said. The soft-spoken Hasselbrock said she expected to be in the top five but not necessarily gunning for the win. Early in the race, she and Poolesville’s Nandini Satsangi, second in 20:12, separated themselves from the pack. [button-red url=”https://www.facebook.com/media/set/?set=a.1205115692848994.1073741866.189448104415763&type=1&l=d7542886c3″ target=”_self” position=”left”] Photos [/button-red]For Satsangi, the DCXC Invitational offered a challenge she had yet to encounter in her first season: not racing in the morning. Most freshmen would perhaps be thinking about how to time their nutrition differently. But Satsangi, who has epilepsy, had to think about when to take her medication. “It made it difficult to control my pace,” she said with a big smile, still absorbing her performance. 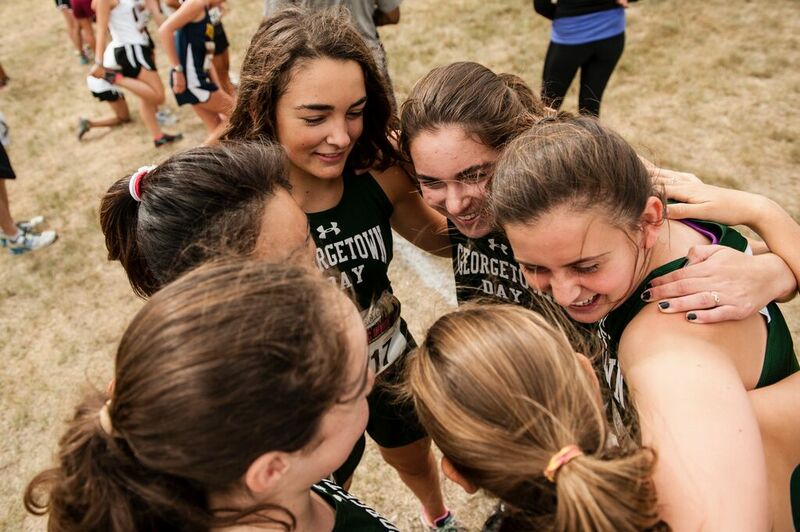 Her best effort helped Georgetown Visitation win the team title, as McKenzie’s classmate, Brennan Dunne, came through in 10th in 21:29. Washington-Lee, in second, edged out Briar Woods by just a point. When they hit the track, Freedom’s Connor Wells seemed to have an insurmountable lead. Until he didn’t. Wells held off Jackson, in second, and Baum, in third, though they all finished in the identical times of 17:07. Jackson and Baum had at least one thing in common. They weren’t pumped up just to be on the podium. [button-red url=”https://www.facebook.com/media/set/?set=a.1205113746182522.1073741865.189448104415763&type=1&l=14d985234b” target=”_self” position=”left”] Photos [/button-red]Trinity won the freshman team title with just 15 points, putting seven boys in the top 20, with a spread of 17:07 to 18:44. Nick Neumann was fifth in 17:52, Nick Stauble seventh in 18:02. Waggoner, in his 14th season, was pleased by their performances. 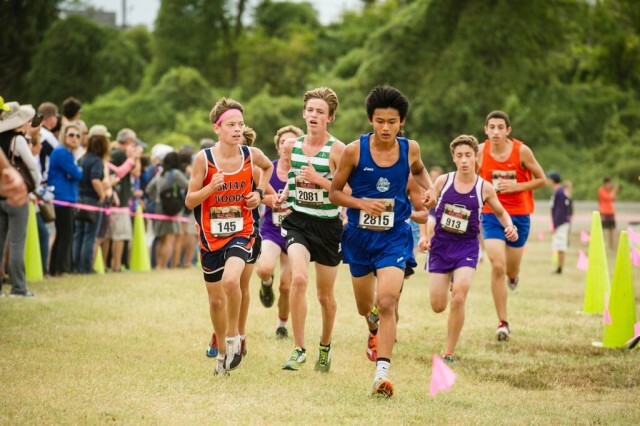 Trinity was followed by Freedom and Thomas S. Wootton in the freshman boys team standings. Holt passed through the mile in 5:28, 16 seconds up on the field, and pushed further ahead to earn a decisive victory in 18:18 and help George C. Marshall win the team title. It was the fastest girls’ time of the day. [button-red url=”https://www.facebook.com/media/set/?set=a.1205121159515114.1073741867.189448104415763&type=1&l=12576773b0″ target=”_self” position=”left”] Photos [/button-red]Wolcott was in turn a decisive runner-up. 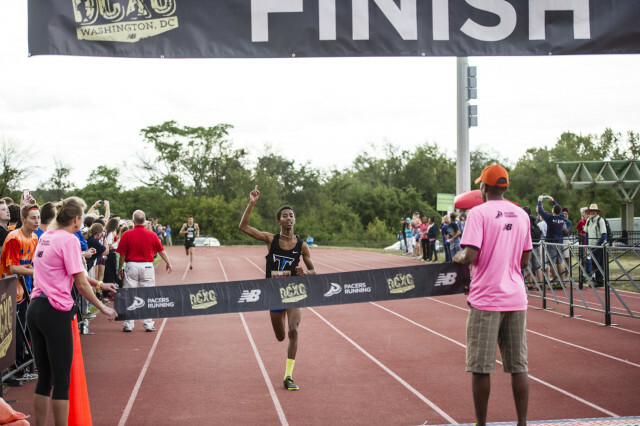 Walter Johnson’s Abigail Green rounded out the top three in 19:25. In the team standings her squad was right behind second-place James Madison, led by Jeana Bogdon‘s fourth place showing in 19:45. For meet director Desmond Dunham, the race inspired some double duty. The Wilson coach was pleased with the performance of his sophomore girls. Alex Hannah led Wilson, finishing 20th in 21:15. Rest in peace Yogi Berra. This one really did seem like déjà vu all over again. [button-red url=”https://www.facebook.com/media/set/?set=a.1205122502848313.1073741868.189448104415763&type=1&l=5010c50dd9″ target=”_self” position=”left”] Photos [/button-red]The sophomore boys race went out conservatively. A big pack went through the mile in 5:15. This was followed by a big slowdown – a second mile covered in roughly 5:40 – that kept around 10 boys in the hunt for the win. Warren, of Trinity, said: “I didn’t want to get out too hard. I just stayed with the pack, and then with about a mile to go we started pushing it. It was all over. Warren had the victory all wrapped up. But then Tuscarora’s Derek Johnson pulled up next to him. Trinity also won the sophomore title. Gonzaga was second, led by John Colucci, last year’s freshman winner, in seventh in 17:11. Tuscarora was third. As dusk crept closer there was almost a chill in the air. The wind held steady as more jubilant harriers, done with their races, ran back and forth – field to track, track to field – cheering on their teammates. 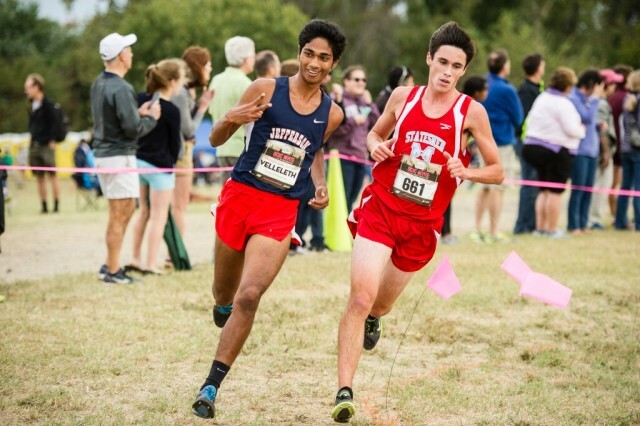 This year Thomas Jefferson’s Saurav Velleleth was on the starting line. Last year he won a Varsity B race, in the morning, so he could go to Homecoming. [button-red url=”https://www.facebook.com/media/set/?set=a.1205126889514541.1073741870.189448104415763&type=1&l=56007a46ac” target=”_self” position=”left”] Photos [/button-red]Perhaps describing why times, despite cooler temps, were a bit slower than last year, Velleleth said the second loop in the field was against the wind “and that kind of threw me off.” It didn’t throw him off much, though: Velleleth won in 16:16, becoming the day’s first varsity boy to win a race easily. Runner-up was another matter. Velleleth left George C. Marshall’s Patrick Lynch in what Lynch described as no-man’s land and ultimately a tight race for second. Lynch held off third place Jackson Betts, of W.T. Woodson, by just a second. Jackson was just a second ahead of James Madison’s Sean Grimm, who was just two seconds in front of Gonzaga’s Harry Monroe. Velleleth said he “knew it was going to be a fun race.” And he riled up teammates and Thomas Jefferson parents when, talking to Farley, he mentioned what Klapper had said after the sophomore race: “We want to win states,” Velleleth said. In the junior girls division, James Madison’s Devon Williams won in 18:49. [button-red url=”https://www.facebook.com/media/set/?set=a.1205123919514838.1073741869.189448104415763&type=1&l=3825fab401″ target=”_self” position=”left”] Photos [/button-red]On one hand, it was a slower time than Holt and Wolcott had run in the sophomore race. On the other, Williams’ win was even more dominating. She won by 46 seconds, finishing before the next runner, Winston Churchill’s Julia Reicin, had even entered the track. Reicin was proud of her own effort. She ran her own race, she said, starting slowly and patiently moving up to second, the way she likes to run. Williams’ victory, meantime, catapulted James Madison to the junior team title. 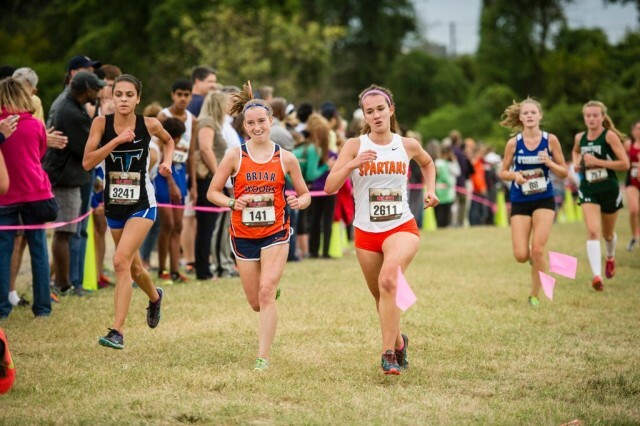 Olivia Woods, third in 19:46, helped Walt Whitman finish second ahead of Thomas Jefferson. Westfield’s Sara Freix had run hard. She had to sit for a while, looking woozy, before she could talk to a reporter. 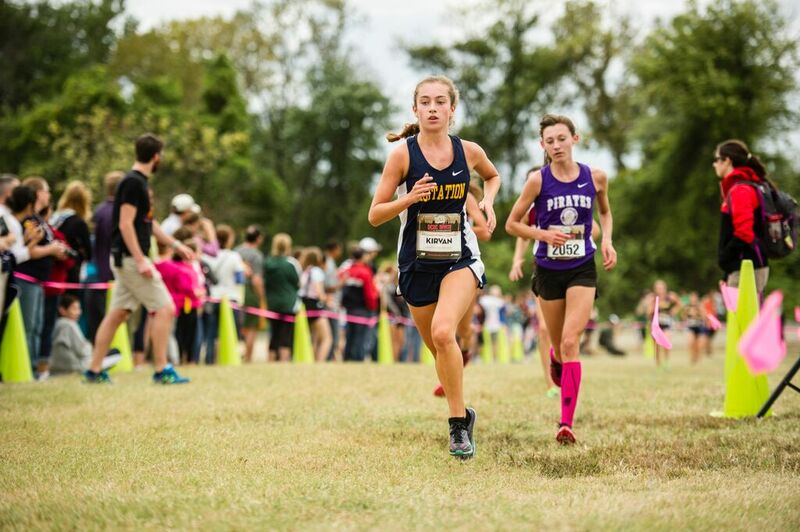 While she caught her breath, James Madison’s Morgan Wittrock, who edged Freix by one second to claim runner-up in 18:46, talked about how racing against Freix has been an important part of her development as a runner. Freix rolled her ankle earlier in the week; she ran with it taped up to be safe. It turned out, though, to be her secret weapon. Having a little extra rest in her legs helped Freix run her best race of the season. Running only represents a third of Knibb’s endurance sports talent. She is one of the best junior triathletes in the world and juggles two racing seasons (her triathlon season, she said, started in May and ended the Friday before last). Cross country and triathlons have a lot of overlap, obviously, but one commonality seems perfect. Knibb’s triathlons end with a 5k. Thus, she is training for the cross country distance year-round while also biking and swimming. James Madison also won the senior team title, followed by Walt Whitman and Walter Johnson. Tuscarora’s Fitsum Seyoum only took up cross-country last year. He went out for track as a freshman, he said, but didn’t like the cold weather. This has had him flying under the radar; he was not an All-Run Washington selection heading into this season. Not anymore. He had already won the Monroe Parker and Great Meadows invitationals, though an ankle injury forced him to drop out of Oatlands last weekend. [button-red url=”https://www.facebook.com/media/set/?set=a.1205132242847339.1073741872.189448104415763&type=1&l=bf341ae89f” target=”_self” position=”left”] Photos [/button-red]He followed Woodson’s Robert Lockwood through the mile in 4:55. Georgetown Day School’s Tristan Colaizzi, who won the junior race last year in 15:41, was a few seconds back in 4:58. 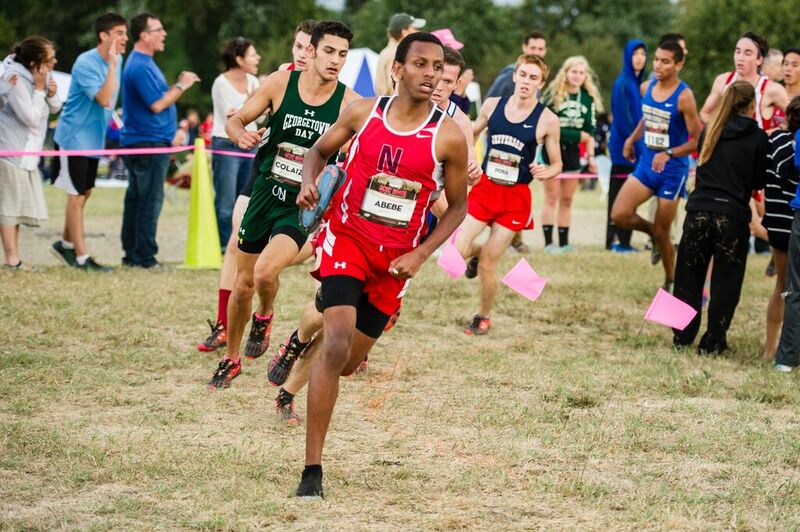 But Seyoum did not wait for the track to get moving. “I decided it was going to be a gutsy day and I’d just go for it,” he said. Lockwood finished in 16:03. Colaizzi moved ahead of him to get within striking distance of Seyoum and crack 16 minutes: 15:59. As it happens, Colaizzi worked for Pacers last summer. Part of his experience was learning about the work that goes on behind the scenes and on race day to stage a high school cross country invitational.